Find MBA: The UO’s new MBA track in Sustainable Business Practices will teach students how to balance social, environmental and financial responsibilities. Portland Tribune: UO’s Digital Newspaper Program will help the Oregon City Public Library digitize the early Oregon newspapers published from Territorial Days through 1922. AroundtheO: Tim Duy, a well-known economics professor at UO, was interviewed Wednesday for an Al Jazeera segment on the Federal Reserve System. 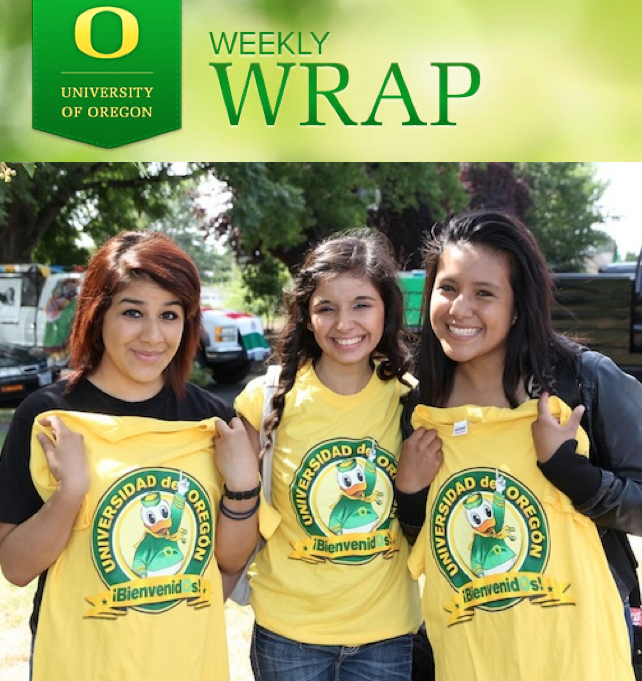 Celebrating Champions: For the third year in a row, the University of Oregon was a major sponsor of Fiesta Mexicana in Woodburn, Oregon. AroundtheO: The SOJC has announced that three short documentary films by UO journalism students were recently recognized at the regional equivalent of the Emmy awards. ScienceBlog: According to a study conducted by the University of Oregon, librarians have gone from thinking of themselves as the knowledgeable person with the best answer to being an interpreter and connector who points the patron in the right direction. AroundtheO: A study led by Leslie Leve, professor of counseling psychology and human services at the UO, has concluded that smoking during pregnancy can lead to psychological problems in offspring. AroundtheO: University of Oregon faculty, staff and students are invited to bring their families and be part of the fun on Saturday, Aug. 24, when the UO participates in the Eugene Celebration parade. California Track & Running News: Run TrackTown, a weekend celebration of running featuring the Eugene Marathon, debuts July 26-27, 2014 at Hayward Field in Eugene. Stadia: Designed by Gene Sandoval, the UO’s new football facilities are intended to evoke a vision of the future and reinforce the public’s fascination with the Ducks.